To ensure reliable performance, units are highly immune to electrical noise and operate from -40 to 75°C. 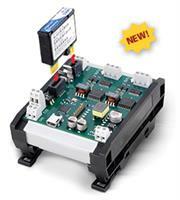 Power sources from 6-32V DC are supported to simplify battery and solar-powered applications. Units mount securely on a DIN rails with 25g shock and 4g vibration resistance. Hazardous location approvals are pending for UL/cUL Class 1 Div 2 and ATEX/IECex Zone 2 standards.